This entry was posted in Ali Hammad, Original Photography and tagged bear safety algorithms, Canadian Rockies, DP challenge: Unexpected, fiction, postaday, The Daily Post, The jungle of Wall Street, writers, Writing. Bookmark the permalink. this must have shed the blues away. Excellent story. Thank you for your encouragement. I took the photo from the safety of a vehicle and a telephoto lens. The story is mostly made up. Thank you. The photo is genuine, but I took it from the relative safety of a zoom lens while seated in a car. The story is just a figment of my imagination. LOL. Okay, you got me! 😛 I believed it, that just goes to show what a fab writer you are. “Fab.” That sounds wonderful. Thank you for making my day. Hi Ali, i too thought it was a true story because a similar story really did happen to my son, Hussein. (he grew up on the lap of a Sufi Master.) As a young man, he used to go up to nearby Hawk Mountain to meditate and enjoy hiking and nature. A bear suddenly appeared on his path. He stopped and the bear stopped. 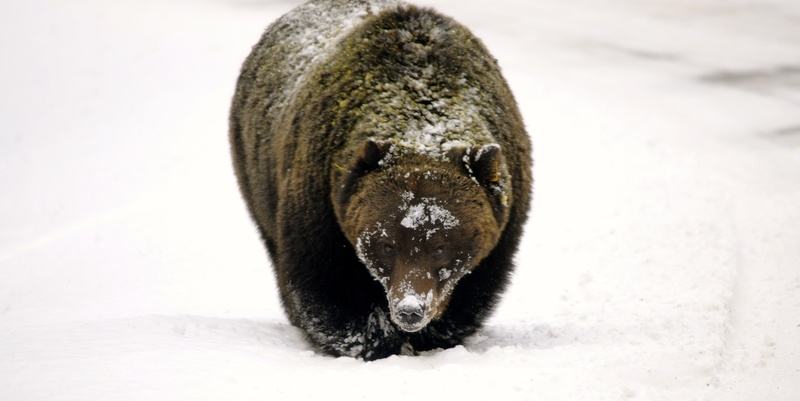 (It was a black bear, not a grizzly, but still….a bear!) He just stayed calm and recited the Bisman for awhile and the bear grunted and walked away. Alhamdulillah. What an amazing story! I have heard of art imitating life, but this is the first time I have actually found that to be the case. Also, I am intrigued by your son’s growing up with a Sufi. Perhaps, if you’d be so kind as to ask him, he may share some of his experiences on this blog in a guest post. I am sure that would be of much interest to many.